Home » Frequently Asked Questions » Why Does Georgia Have a Workers’ Compensation Law? Why Does Georgia Have a Workers’ Compensation Law? Georgia’s workers’ compensation system dates back to 1920, when the Georgia legislature created an exclusive remedy system to handle work injury claims. Currently, this system serves over a quarter of a million employers in Georgia and over 3.8 million workers. Georgia’s workers’ compensation law is called a “no fault” system because it does not matter if the injured worker was negligent. Coverage is automatic for all employees of companies that employ more than three (3) people, and employers with more than three employees are required to purchase workers’ compensation insurance. Employees cannot bargain away their rights to file workers’ compensation claims – the right to pursue benefits is guaranteed by state law. At the same time, employees have no choice to opt out of the workers’ compensation system – it is considered an exclusive remedy for injured Georgia workers. Prior to the passage of a workers’ compensation law, injured employees would have to file a lawsuit against their employees in case of injury. State lawmakers recognized that most employees did not have the money to hire lawyers to file these lawsuits and that delays in coming to trial would not benefit either side. In exchange for faster adjudication and the elimination of negligence from the equation, injured workers can pursue medical benefits, lost wage benefits and travel reimbursement, but they cannot claim damages for pain and suffering. Even though you cannot sue your employer for negligence, or pain and suffering for injuries arising from a work accident, you can sue third parties for negligence or product liability. For example, we often represent clients in car accident injury claims (where pain and suffering can be compensated) and for workers’ compensation benefits when the work injury involves a motor vehicle crash. You can also sue workers’ compensation doctors for medical malpractice if your posted panel treatment falls below the standard of care and you are damaged. 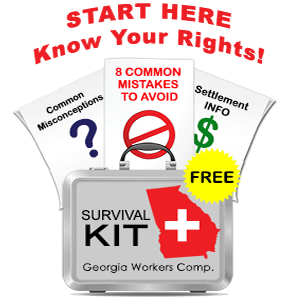 Disputes in a workers’ compensation case are not decided by state court judges – instead, employers and employees present their cases to judges at the Georgia State Board of Workers’ Compensation. The State Board is funded by assessments from insurance companies and self-insured employers. In our practice most workers’ compensation cases are settled either out of court or in mediation by a mediator. When a case settles, the injured employee gets a lump sum payment and agrees to dismiss his/her claim against the employer and insurance company.